Lightweight and easy to hang! Weighing just 13.5 pounds, the Summit rsxHAWK Tree Stand is an excellent choice for backcountry bowhunters. 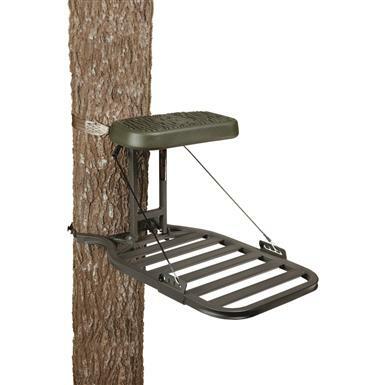 It features a roomy platform and flip-up seat that allows you to lean against the tree for easy standing shots. Plus, your stand will always be level thanks to the easy-adjust, self-leveling cable system. Platform Dimensions: 20"w. x 26"d.
Seat Dimensions: 18"w. x 10"d.